The streets of Brentford were filled with clouds of acrid smoke on the afternoon of Tuesday 15 March whilst firefighters tackled a blaze in the grounds of Syon House. 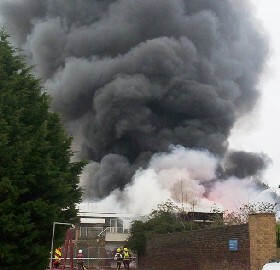 The Fire Brigade were called at 14.43 to a fire in the disused conference centre within the grounds. The serious nature of the fire meant that six units from around West London attended the fire, with up to 40 firefighters working to put out the flames. There was concern over the safety of 23 children in the nearby Snakes and Ladders nursery. The children and staff were instructed to remain in the building, with the air conditioning turned off. They were led to safety at 17.00. The burning buildings formed part of a conference centre which had remained unused for some time, and was due to be demolished to enable the building of a hotel. There was no indication as to the cause of the fire.